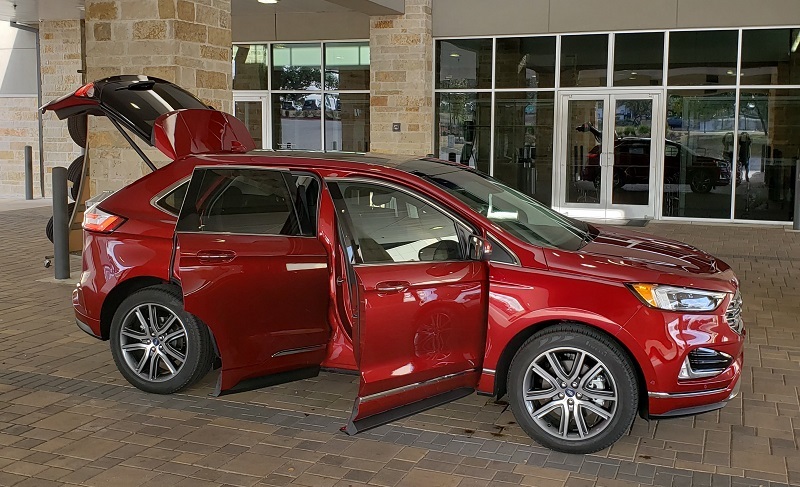 The 2019 Ford Edge is a mid-cycle refresh of their second-generation (2015) Edge mid-sized crossover (CUV) that was first introduced in the U.S. back in 2011. Interestingly, it was actually a manufacturing ‘cousin’ at the time to the Mazda CX9. A key attribute – noted then – was its generous interior space for a two-row crossover. 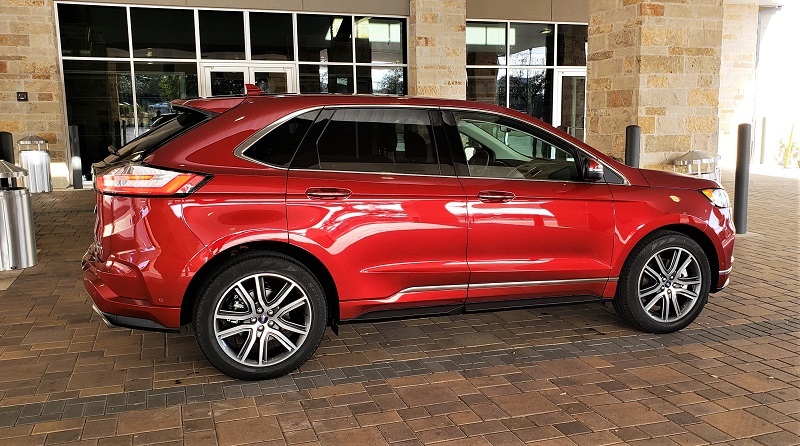 In 2015, Ford redesigned the Edge with new exterior treatments, powertrain upgrades, more amenities, increased interior space and a new Sport trim. 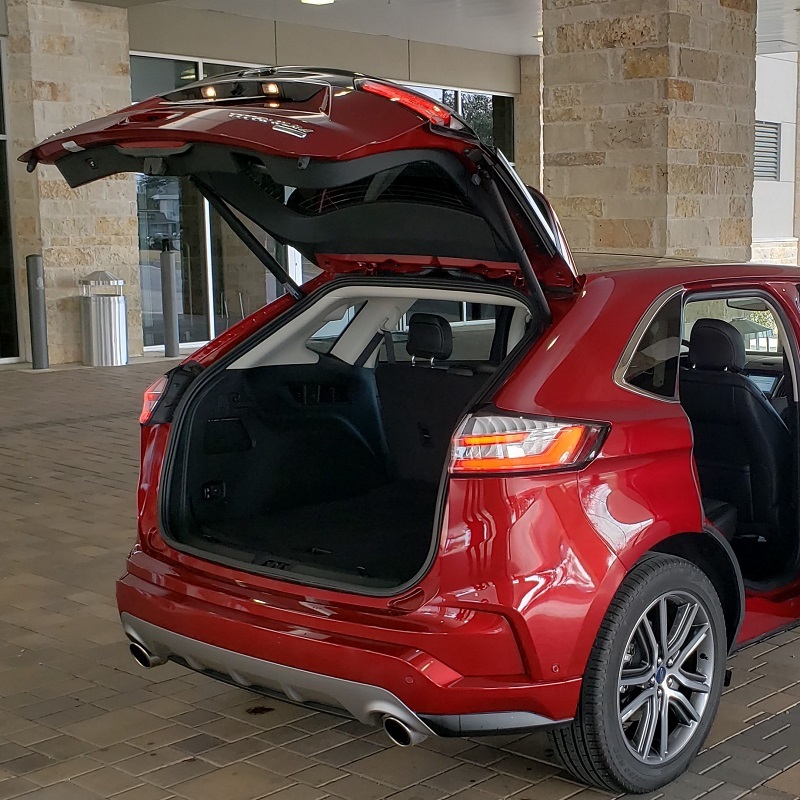 A steady seller for Ford, Edge sales reached a peak in 2017 of 142,000 units in a CUV segment that was becoming the ‘place-to-be’ for manufacturers moving away from sedans. 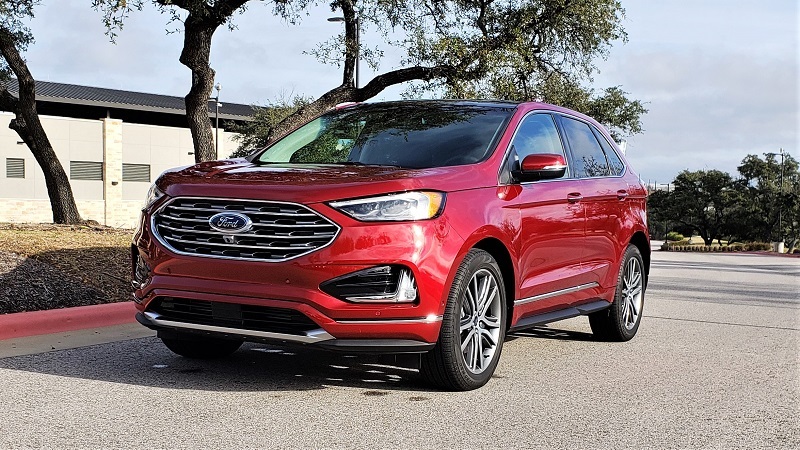 Ford – also moving away from sedans – has updated Edge for 2019 be more competitive in the mid-size CUV segment, Ford updated the Edge measurably for 2019 to meet their challenge. 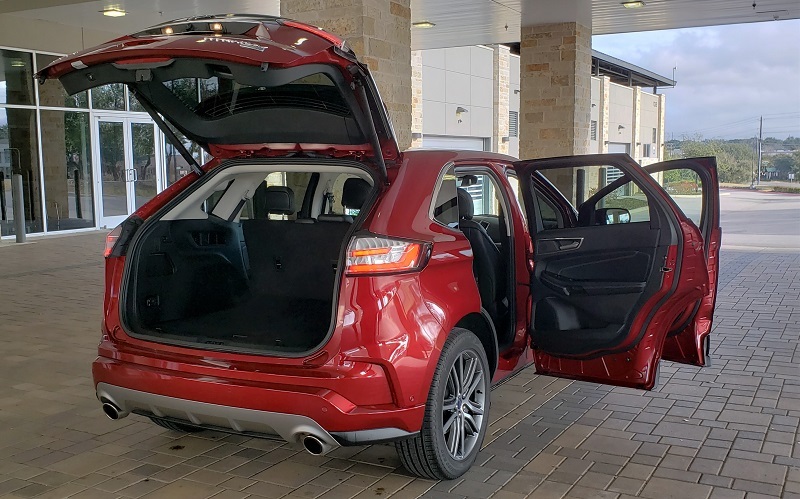 The 2019 Ford Edge as sportier front and rear fascia’s, grille, hood and hands-free liftgate. The powertrains now feature an 8-speed automatic transmission. SiriusXM is standard and SYNC Connect has been upgraded to FordPass Connect across the line. The system is compatible with Android Auto, Apple CarPlay, Ford+Alexa and Wave Navigation. Other enhancements standard or available include Ford Co-Pilot360 suite of driver assist and safety features, LED headlights and fog lamps, new rotary gear shift, wireless charging pad, lens washer for the rearview camera and five newly styled wheels in sizes 18- to 21-inch, depending on the model. Key for us – and we suspect a lot of others – is its very spacious cabin. 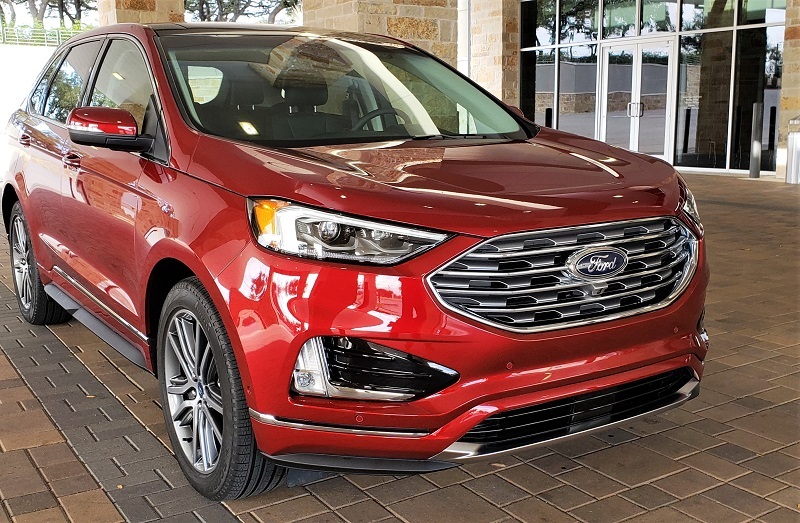 Five full-sized adults ride comfortably in the 2019 Edge. Headroom first and second rows is over 40-inches. Legroom up front is 42.6-inches and 40.6-inches rear. Shoulder room is BIG – over 60 inches both front and rear. Cargo room behind the second row is almost 40 cubic feet. 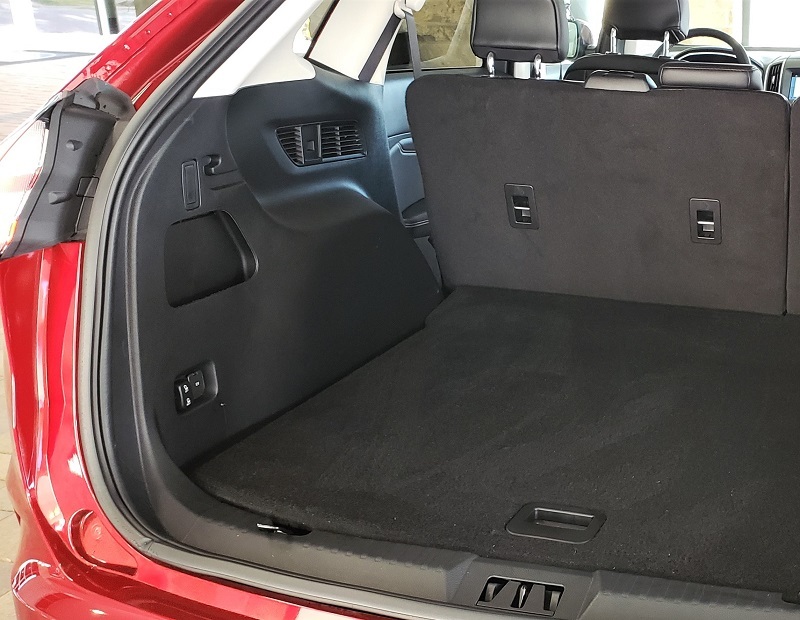 And, if you fold the second row flat, Edge gives you 73.4 cubic feet of cargo space. 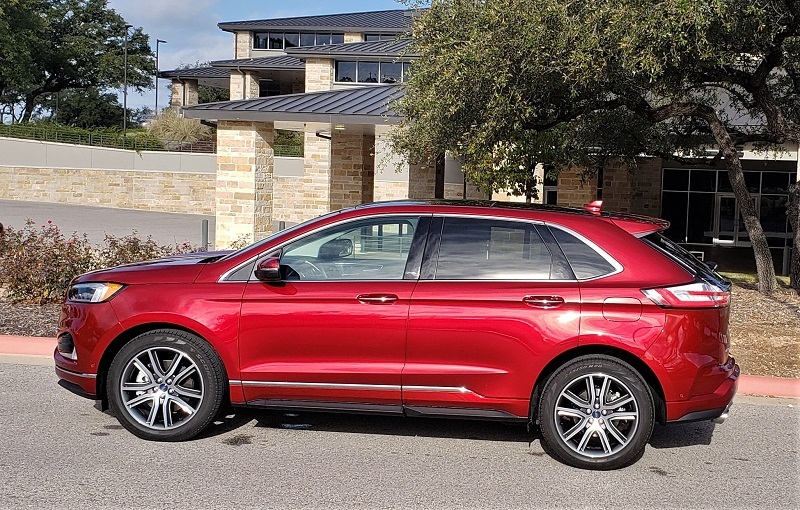 Adding in Edge’s more spirited performance, upgraded technology, quieter cabin, smooth ride with crisp handling and braking, the 2019 Edge should be a stronger competitor in 2019. 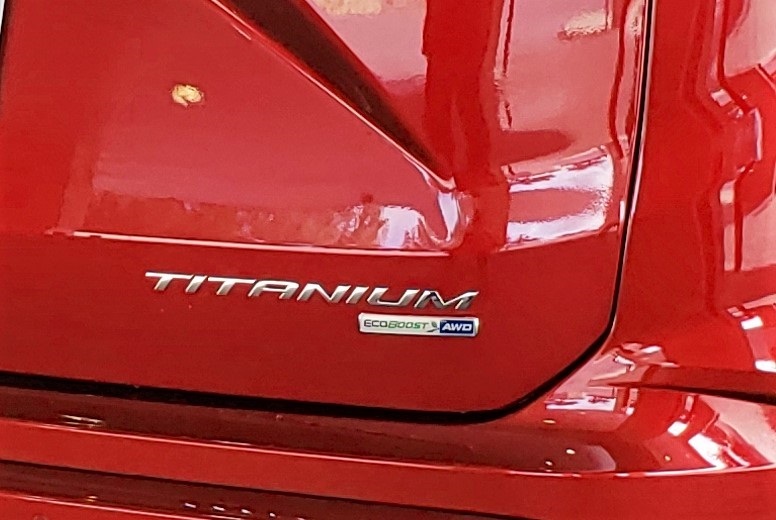 Ford delivered us a 2019 Edge Titanium AWD – pretty close to fully-loaded up – for drive test recently. It came in a rich Ruby Red Metallic Clear Coat with Ebony Interior. The MSRP for our Edge Titanium AWD was $40,355. With packages, options and delivery – the final price was $47,585. The Edge Titanium was powered by the standard Twin-Scroll 2.0L EcoBoost I4 engine with Auto Start/Stop. There is a button to disable this feature if so desired. It delivered 250 horsepower @5,500 rpm and 280 lb.-ft. of torque at 3,000 rpm. 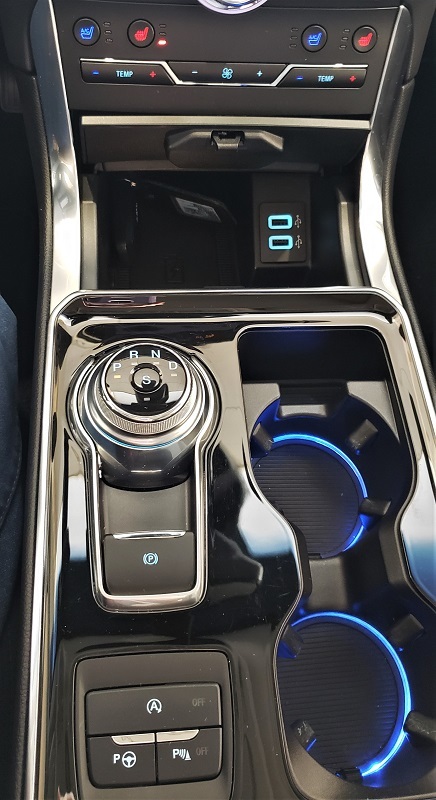 Mated to the Rotary Shift Gear managed 8-speed automatic transmission with SelectShift capability and Paddle Shifters and Hill Start Assist, it ably delivers that power to the Intelligent AWD that featuring Torque Vectoring Control plus AWD Disconnect for fuel efficiency when appropriate. 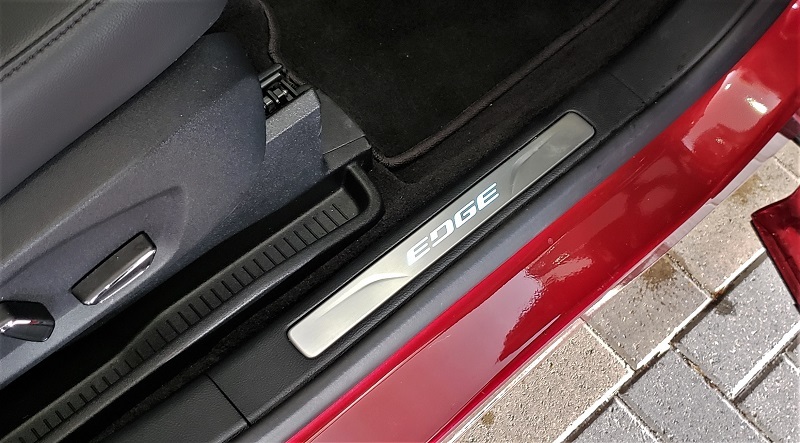 The fuel economy rating for our test Edge AWD was 21/28 mpg city/highway and 23 mpg combined. Our test Edge Titanium was fitted with the optional 20-inch Bright Machined Aluminum Wheels trimmed with Premium Dark Stainless-Painted Pockets and mounted with P245/50 R20 All-season tires. The Titanium trim package featured a chrome grille, body color front bumper, lower fascia and side cladding with chrome inserts and a body color rear bumper. Other elements include Adaptive LED Headlamps with LED Amber Light Blade Turn Signals, LED Fog Lamps and LED Taillamps, Rain Sensing Variable Intermittent Windshield Wipers with De-Icer, Power heated and folding side mirrors with Approach Lamps and Turn Signal Indicators and chrome dual exhausts. Elements of note in the Edge Titanium included the Power Panoramic Vista Roof with Power Shade, Ambient Interior Lighting and Illuminated Door-Sill Scuff Plates. Seating was comfortable and generous. The Front Row Sport Bucket seats had leather-trim and with perforated inserts and were both heated and ventilated. The front driver and passenger seats both had s 10-way Power Adjustment. Metal Plated interior accents including Mechanical Stripe Aluminum on the instrument panel added a subtle refinement to the interior. The cargo area (behind the second row) features tiedowns, cargo cover, LED cargo light and 12V power outlet. A Hands-Free, Foot-Activated Power Liftgate opens wide and high for easy cargo loading. Audio and infotainment is provided through a Bang & Olufson 12 speaker audio system. It includes SYNC3 with SiriusXM, HD radio, CD player, AppLink Connectivity and is compatible with Apple CarPlay, Android Auto, Ford+Alexa and Waze Navigation. A Voice Activated 8-inch Touchscreen Navigation System with Pinch-to-Zoom capability included SiriusXM Traffic and Travel Link with 5-years prepaid service. 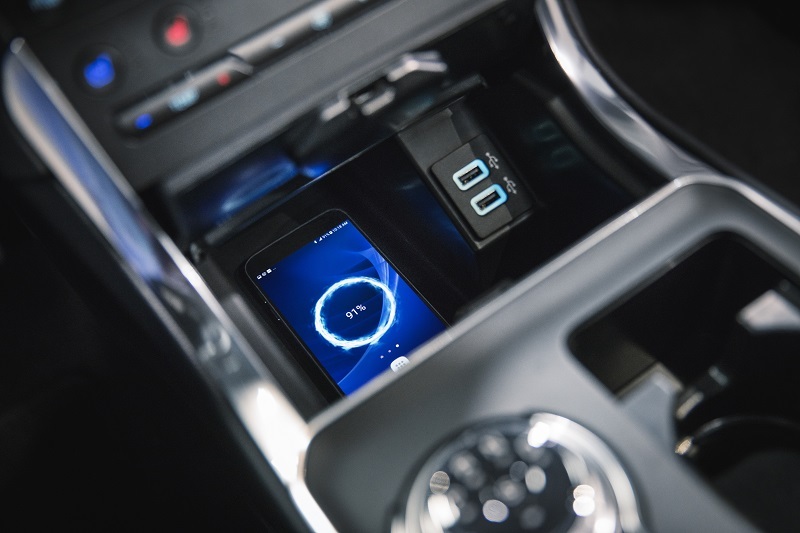 Other features included the FordPass 4G WI-FI Hotspot that connects up to 10 devices, Wireless SmartPhone Charging Pad, two Smart-Charging Multi-Media USB Ports and four 12V Power Points plus a 115V/150W AC Power Outlet. Driver Convenience items included Remote Start, Push-Button Start, Adaptive Cruise Control with Stop and Go, dual 4.2-inch Driver Configurable LCD Color Information Displays, Leather-Wrapped and Heated Steering Wheel with audio and cruise control and Ford’s Enhanced Active Park Assist with Parallel Park, Park Out Assist, Reverse Perpendicular Parking and All-Around Sensing System. The Edge Titanium’s Ford Co-Pilot360 Package included Auto High Beam Headlights, BLIS (Blind Spot Information System) with Cross Traffic Alert, Lane Keeping Systems (Lane-Keeping and Alert and Driver Alert), Pre-Collision Assist with Automatic Emergency Braking (Pedestrian Detection, Forward Collision Warning, Dynamic Brake Support) and Rear-View Camera with Camera Washer. It was also equipped with Wiper-Activated Headlights, Evasive Steering Assist, Lane Centering and Post Impact Braking, 180-degree Front Facing Camera with Washer and Split View capability, Advance Trac with Roll Stability and Curve Control and Individual Tire Pressure Monitoring. A Dual Headrest DVD Rear Seat Entertainment System is available. The AWD can be equipped with a Trailer Tow Package and Trailer Sway Control, enabling it to tow up to 3,500 pounds. Plus, replacing the previous Sport, is the ST Performance (MSRP $42,355). It comes AWD only with a 2.7L EcoBoost V6 and 8-speed automatic transmission. The new Edge ST Performance stands out in several ways (hint: 335 horsepower) from the rest of the lineup. We were able to test drive an ST just three weeks after driving the standard Edge. We will share our ST drive experience with you next week at inwheeltime.com. Learn more about the 2019 Edge here: https://www.ford.com/suvs-crossovers/edge/.